A day after manager Jim Riggleman said that struggling hurler John Lannan had “long leash” and would make his next start in Baltimore this weekend, the team sent him to AA Harrisburg. Lannan was sent down, and reliever Joel Peralta was retrieved from AAA Syracuse. The team will run with 4 starters for the next week or so, due to a Thursday off-day before the Baltimore series that allows for a bit more flexibility in the schedule. The move comes as a bit of a shock, given Riggleman’s assurances yesterday that Lannan was a fixture of the club, and they’d stand by him through a rough spot. The team is hoping that Lannan can fix his mechanical issues with the pitching coach there, Randy Tomlin, that has helped John in the past. This the first time that the team has been without Lannan for more than a day or two since he was called up in 2007.
so when would strasburg’s next start be? WASHINGTON — Nationals general manager Mike Rizzo said that right-hander Stephen Strasburg will pitch every five days until the All-Star break. After that, there are two different scenarios that could happen. Whenever there is an off-day, the club could push Strasburg back a day. The team could also give him time off during the first two weeks of September, then pitch the rest of the month. The club most likely will push him back a day after an off-day. 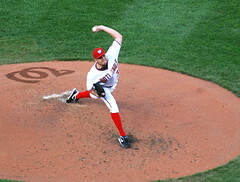 Strasburg is expected to throw between 150 and 160 innings combined between the Minor and Major Leagues this season.